This is a solid stainless steel magnetic anklet. This nickel free anklet has a powerful & permanent 3300 gauss neodymium rare earth north facing magnet in each link. It has shiny silver edges with a textured silver center. This anklet is about 1/4" wide and 1/7" thick. This anklet closes securely with a snap shut clasp. 3rd bracelet ordered and very impressed. Good quality and price. Really nice ankle bracelet, very well made and sturdy. Comfortable to wear. This is a great bracelet and Im very glad I ordered it. I received two magnetic anklets and their quality build was excellent. But, due to my incorrect measurement, I had to return the anklets for a larger size. Bob at MJS was very accommodating and he is seeing to it that the exchange will be made as expeditiously as possible. This is true dedication in making the customer happy. I am very much appreciative and I thank Bob and his team at MJS for the support. I ordered a braclet because I was having problems with my thumb & an anklet because I was having problems with my ankle. My thumb & ankle feel better , less pain. I would recommend magnetic jewelry to family & friends. EXACTLY AS ADVERTISED. OUTSTANDING CUSTOMER SERVICE. A PLEASURE TO DEAL WITH. In all honesty I was at my wits end with my hip, lower back and leg issues. Over the last few months, Ive bought wraps, memory foam shoes and pillows, even a cane to assist me in standing for periods of time. Looking into copper therapy, I happened across this website. Read the reviews and found that they carried stainless steel, (which is what I wear because it doesn't peel or tarnish) and took a chance. I kid you not, 30min after I put my anklets on, (I bought 2) I was standing longer, and using my cane less. The next morning, which is today. I took my dog for a walk in the park. Now, I am not sure if it is a placebo effect or what, but I am reasonably mobile again. Not like a 20something but 60% more than before the anklets. In saying this, I'm looking forward to seeing what a week, month, even a year will bring. My advice, if you can afford it, try it. Thanks guys! 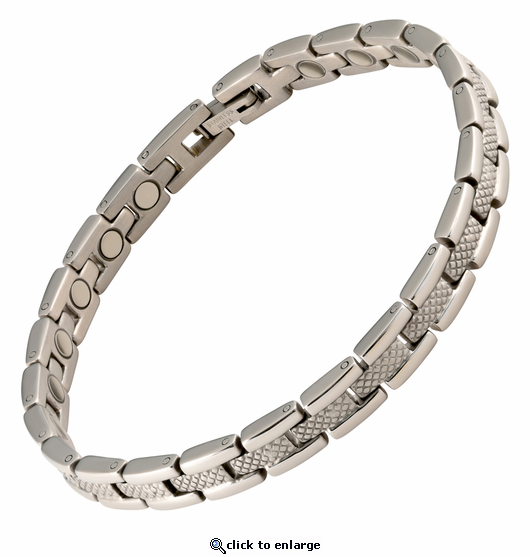 I bought the magnetic therapy anklet stainless steel for my brother as a gift to help him with his pain in his feet. He told me after wearing it for a week, that it has been helping him quite a bit. He loves it and wears it everyday. It fit him nicely and I plan on buying me one next. Truly works! Thanks for your support and quick service. I have had ankle issues over the years from a number of sports injuries. It seems to be affected by use and at times weather. Using the anklet bracelet has reduced and eliminated the discomfort and I do not experience discomfort with either. I sleep on a magnet mattress pad. I will be traveling soon and won't be sleeping in my own bed and since I am flying I am unable to take my pad with me. I stayed at my son's overnight to babysit and during the night my arthritic left me woke me from pain. I was concerned about being away from home to sleep and since the magnet bracelets I bought helped me I thought I would try the anklet. Experimented 3 nights off magnet mattress pad & wore the anklet. Success! Did not wake up with any pain so I wear my anklet all day and will wear it at night when away from home. It works, I love it. I've had my new anklets for about two weeks now and they are wonderful! I wear one on each ankle, I wear them all the time. I suffer from Restless Leg Syndrome and these little gems have made a huge difference. Not only for sleeping but for sitting in a movie theatre, on a plane or just relaxing while reading a book. Thanks so much!!!! I love that this anklet is flat - lays very comfortably against my skin. What I was pleasantly surprised at how sturdy the clasp is. I wear this anklet constantly - even in the shower and it has never become unclasped. I measured my exact ankle size and did NOT add any increments and the anklet fits perfectly (I've got some fat little ankles so I'm thrilled this fits perfectly). I also purchased this anklet for my elderly mother (12 inch ankles) and she is also very pleased with the fit and the fact the magnets work - less pain! I had an anklet that I lost and this is a replacement. It helps with foot pain & balance. Looks great. Your chart helped me select the perfect size. Has helped reduce pain in the ankle from an old basketball injury. I love the look and feel of the anklet. No snagging. Now I have an anklet with positive health benefits. I'm really impressed with the 3300 gauss neodymium rare earth north facing magnets in each link at an affordable price. Thank You! Love the look, feel, and difference in minor ankle pain being alleviated! Great service and fast delivery! Anklet is excellent quality and very comfortable. Seems to be helping with nerve pain in feet and legs. I've not removed it since I got it. This is a wonderful company!!!!! Love it. Very fast delivery. Just 1 week to arrive in Spain. Absolutely wonderful. Received it in just a few days. I have only taken it off to shower since I got it. Looks just like the picture and has helped tremendously with heel pain from plantar fasciatis. Love love love it. I have been having pain & stiffness in my left knee since I wrenched it on New Year's Eve. A co-worker loaded me a relatively weak (I think about 4800 total gauss rating) Sabona 'sport' band that I tried & I saw an immediate reduction in pain & an improvement in range of movement. I figured in this case more would be better, and I was right. Ordered this one; service was great (shipped the same day), the unit was exactly as described & fit great. Within a couple of days my pain was completely gone & I can actually bend my knee completely. I immediately ordered a second anklet for my right leg as a preventative. Same great service, etc. Even if what I am seeing is a placebo effect, it works for me. The only change I would make would be to build these with titanium in place of the stainless. I like my anklet, it looks exactly like the picture, fits perfectly, it shipped within 4 four days. I am very happy with it. I have worn it all the time since I received it. So far it has helped with my knee pain and I actually haven't had a migraine (keeping fingers crossed) I received it March 7th and today is March 18th and I have been averaging a migraine every 2 weeks, so I am hopeful. I got an anklet because I have to deal with tapes and was concerned with the magnets. I have ordered another magnetic bracelet for my daughter because she has migraines and I am hoping it will help her. But I am very pleased with mine and may order a bracelet later on just because they are very attactive. Thank you for doing such a good job. I am very happy with my purchase and will recommend your site to others and will most likely make more purchases in the future. Excellent quality these were more helpful than I imagined. Since wearing them the neuropathy in my feet have almost totally gone. Before when i stepped on something on the floor I could not feel it now I can. Love it! I received the anklet a lot sooner than I expected. When it arrived it was in 2 pieces (a pin had come out). I e-mailed the company on a Friday evening and did not expect a reply until at least Monday but to my surprise I had a very apologetic e-mail from Bob. He said he would re-send the anklet with a stamped self addressed return envelope. That also arrived quickly. I had the replacement anklet quickly as well. Awesome customer service!! This is my third purchase from the company and I have been very satisfied with the quality, service and prices. I wear two anklets all the time now for my knees and cannot believe the difference they have made. I started with just the one and the results were so great, I had to get another. I have recommended this company to family and friends. I never believed in magnetic therapy but I do now! The anklelet is very stylish and attractive, also looks like it costs more than I actually paid for it. It has some weight but it is not felt when I am wearing it. As a matter of fact, I do not feel that I am wearing anything on my ankle. I am still feeling all the pains that I had felt before, but I am giving it some time for my body to adjust to it or vice versa. Customer service is thorough, even after placing my order they contacted me to ensure that I had ordered my correct size. The web site is one of the best. I am impressed that time is taken to tell me all about the product I am ordering. I would definitely shop from this vendor again. I bought this anklet as a birthday present for my sister. She loves it and I love it, especially since neither of us needs to be concerned with the product becoming unclasped and getting lost. I have recommended these products to co-workers and will be purchasing one for myself and another sister soon to help us manage our knee pain. Excellent quality and well made with a good clasp. If you're looking for a magnetic ankle chain then this is it. The stainless steel allows me to wear it 24/7. Just do it! you made for me are great. I wear them 24/7 and the knee pain is gone. I will now get 2 for my wrists.